'I want to take some quite incredible photographs that have never been taken before… pictures which are simple and complex at the same time, which will amaze and overwhelm people," wrote Alexander Rodchenko in his diary on March 14, 1934. "I must achieve this so that photography can begin to be considered a form of art." These are bold words coming from a man who had picked up a camera for the first time only 10 years earlier, aged 33, and would all but give up photography just six years later. A tightly focused new exhibition of Rodchenko's photographs at the Hayward Gallery in London shows how - during that brief, passionate, turbulent period - the artist fell not only in and out of love with the medium, but also disastrously in and out of favour with the Soviet state. The exhibition, supported by Chelsea FC owner Roman Abramovich, begins with Rodchenko's photomontages of 1923, those sparky hodgepodges of photography, text and graphics that inspired Franz Ferdinand's recent record covers. "At that time in Rodchenko's career, the Soviet powers and the Russian avantgarde, they danced together," says the exhibition's curator, Olga Sviblova. "Both believed absolutely that they were working to change reality for the better, and that that change would arrive tomorrow. It was a big delusion, but they believed in it all the same." In a country where 70 per cent of the population couldn't read or write, photography was a powerful medium - Lenin himself had suggested during the civil war that each of his soldiers should carry not just a weapon but a camera, too - and by 1924, having worked primarily with paint for years, Rodchenko felt ready to take it on. "It would seem," he said later, "that only the camera is capable of reflecting contemporary life." His first efforts, a handful of which feature in the exhibition, were poorly printed and unremarkable: a little wooden house in the countryside; casual portraits of his friends, all taken at eye level from a respectable distance. 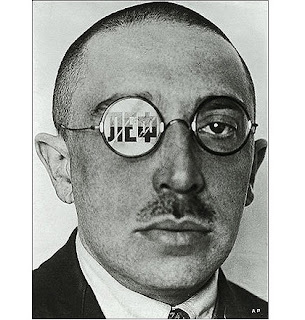 Later in the same year, for a shot of his elderly mother reading through an eye glass, Rodchenko moves nearer to his subject. By the time he releases the shutter, he is close enough almost to plant a kiss on her rounded cheek, her head fills the frame, and the composition suddenly takes on an extra force. It feels like a breakthrough. Over the next five years, Rodchenko became increasingly obsessed with extreme angles, convinced that "the most interesting viewpoints of today are 'from the top down' and 'from the bottom up'". 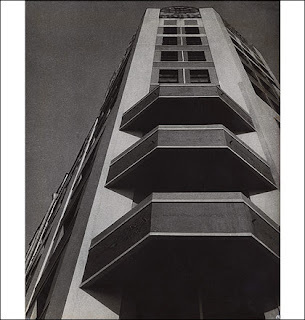 Some shots he took while lying on his back on the pavement beneath his apartment block so that the building appears to lurch and lean, its balconies and fire escapes resolving themselves into semi-abstract forms. 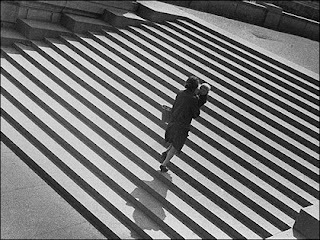 Others were snapped from above, transforming a woman ascending the stairs into a composition of modernist severity. Every image in his unique suite of Moscow street scenes, taken in the late '20s and early '30s for an official publication, is pitched on his trademark tilt: skyscrapers jut diagonally across the shot, trams threaten to rattle free of the frame, and the whole sprawling concrete city fizzes with energy. The apex of his experiments with perspective came, in 1932, with the publication of a set of portraits of Young Pioneers (a Communist version of scouts). One, taken from beneath the chin of a trumpeter, foreshortens his face into a barely identifiable blob. In another, the face of a young girl is given the heft of a marble statue. Compositionally, artistically, the images are a triumph - but politically they were a misjudgment: they suggest not growth and change, but its opposite. "By the beginning of the '30s the authorities no longer needed personalities, they needed people who could be directed," says Sviblova. 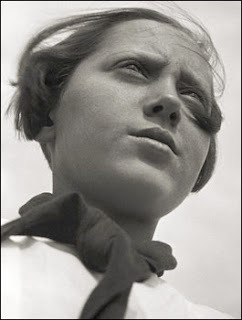 Rodchenko, who "insisted on photographing individuals in an individual way", refused to fit into that category. Following the furore surrounding the Pioneer images - "the face of a normal person has been transformed into the face of a freak, and for what?" 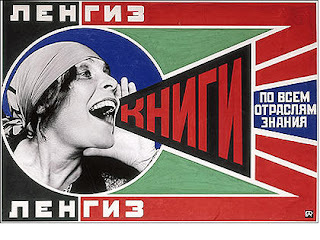 sneered one critic - Rodchenko passed much of the rest of his life in an artistic wilderness. The first show of his photographs in Russia, and the first step to restoring his reputation as a photographer didn't come until 1957, a year after his death. Now, more than 50 years on, comes his first solo show in this country, impressing upon us not only the fact that photography can indeed be a form of art but also that Rodchenko was one of its masters.